Just for fun: a word cloud of my portfolio website. As I looked back through my portfolio website and the courses in the DLL program, I found it interesting the reaction they evoked in me. And maybe I was just hungry at the time, but it made me think of how different kinds of food make me feel. Some topics were like comfort food—parts of the program that I knew were a good fit for me and I was right. Others were like a new cuisine I’d been wanting to try—I knew they would be a stretch for me but I knew I had something I wanted to learn. Yet others were more serendipitous, they weren’t really even on my radar, but when I came across them I discovered something I didn’t know I was missing (these ended up being my favorites). One of the things that drew me to the DLL program was the idea of a self-directed program. Once I got into the program, though, I discovered just how self-directed it was. Even more importantly, I learned about the innovation plan, which allowed me to learn the way I learn best–by thinking about a topic and applying it to a real-world situation. School has never come easy for me, but I got into computer programming without taking any formal computer classes because I had a real problem to solve. Once I learned that this was the approach of this program, I knew this was going to work well for me, and it absolutely did. Organizational change was another topic that I thought would be an enjoyable topic, and I found that it absolutely was. One of the draws for me of moving up into administration (I know, I know, the dreaded “A” word…) has been the ability to see a need and have a real, noticeable, immediate impact. Well, not always as immediate or noticeable as I’d like, but having a leadership position allows me the ability to push for change without needing to push through quite as many layers of opposition above me. The “Influencer” model helped me to think through how to do this in a way that encourages the team that is under my care to lead rather than demoralizing them. Another of my goals for getting a M.Ed. was to understand the instructional side of the college a little better. Though I have worked in higher education for about 13 years, I have been almost exclusively on the operational side. When I moved into an administrative role in my college’s IT department, I wanted more context. That is, I wanted to understand the more about instruction and learning theory to be able to more effectively run an IT department that supports the college’s educational mission and instructors. Courses that dealt with learning theory, course design, online/blended learning, and creating significant learning environments were definitely a challenge for me. That challenge was exactly what I needed and was looking for, and I find it much easier now to discuss learning environments with instructors and I have a much better understanding of how I can support them and students with technology. The first time I tried Indian food was because we just happened to drive by an Indian restaurant and thought it seemed interesting. Perhaps part of what made it so enjoyable was the unexpectedness of finding something so enjoyable almost by accident. In this same way, perhaps the biggest pleasant surprise for me was how much I enjoyed the research and literature reviews. Reviewing the research and conducting some original research. Reading the research completely changed my perspective on developmental education (the subject of my innovation plan), and that has become something I’m passionate about. I’ve been working already to make some changes and implement some new technology to help bridge the gap and empower our academic advisors to help developmental students. It was great to see my progression through the program and what some of my main takeaways were from each course. In the timeline below I share a little bit of how each course contributed to my learning process; you can click through to see each individual course reflection. A course and assignment index is also available for more detail. This course appropriately enough provided an introduction to many of the themes we would come back to again and again through the program--growth mindset, COVA, ePortfolios, and learning theory. This was a momentous course for me, as it was when I developed my first literature review and when I selected my innovation project. Looking back, it's almost humorous to see how naive I was, how far I've come, and how following the research has made me so passionate about this topic. This deeper dive into learning theories, particularly constructivist and constructionist philosophy, was where I began to develop my own philosophy of learning and how best to encourage learning in others. A pivotal course for me, particularly in understanding more about my philosophy of education. This may have been the most directly practical course for me. I deal with organizational change constantly and was in the midst of a minor reorganization (which later turned into a major reorganization). I come back to concepts from this course regularly in my day-to-day dealings. This course was where my innovation plan started to shift. While I thought I was going to just digress a little bit for the sake of getting the work done, I ended up finding a new direction for my innovation plan that fit even better and new topics to research. Honestly, this is one of those courses where a lot of what I learned was not as much about the course content specifically, but I learned and grew a lot in this course. A lot of things started to come together in this course. I more fully embraced the shift in my innovation plan and started to research my interest in artificial intelligence and how it may have a positive impact on advising strategies. This course helped me refine my research questions for the study I would refine and write (in later courses) and plan to submit for journal publication. The focus on "action research" and continuous improvement help to focus the research and keep it practical. This course helped me bring together concepts from previous courses--learning theories and backwards course design--and apply them toward building out a course design into an online course framework. While this course was a bit of an outlier in terms of the flow of the overall program design, it gave me a chance to make connections between some of the technology topics I'm passionate about--such as open source software--and educational technology. I got to get a few good rants in, too, which is always fun. I put in more work for this course than several of the other courses combined, but it was possibly the single most rewarding course in the program for me. I performed some (admittedly fairly rudimentary) original research and put it together into a proposed journal article. I look forward to building on this research and seeing this article published. And here I am, at the end of this particular journey. I am grateful for the portfolio website that's part of the program, as it gives a very easy way to look back to be reminded of lessons learned and reflect on how far I've come. I am grateful for what I have been able to accomplish and for the growth I’ve seen in myself over the past two years. I came into this course a technology professional, and I feel that I have emerged an educator, and a stronger leader. Learning COVA and CSLE by being steeped in that type of environment and by practically working through concepts by developing an innovation plan has given me the tools to lead and empower others to help create the next generation of learners and change the world the only way we can—one learner at a time. See the related literature review for research background on this project. This is an update from my previous innovation plan, reflective of new research and a refined focus, with more to come. Community colleges have long fought the perception that they are just an extension of high school, or “high school with ashtrays.” This is certainly understandable, as they devote a lot of time and resources to striving to ensure that the quality of education is college-level. However, in another sense, assisting the transition from high school to college is an important role that community colleges fill — whether for those students who are not independently wealthy, not able or ready to move away, or who are not yet prepared for college-level work. That third category — developmental education — is an area of the community college that is ripe for disruption. At Sauk Valley Community College, fewer than half of students are successful in developmental education courses the first time, and only half will continue as students past the first year . The current prevailing model places these courses as a barrier to be overcome before taking college-level coursework. A student — who may well have been receiving the message for years that they are “not good enough,” or “not college material” — takes a placement test, where they are told they are not good enough for college-level work. They must then enroll in and pay for classes — often multiple semesters’ worth — for which they will not receive credit. If they cannot pass the first time, the process repeats. Is it surprising, then, that the completion rates are so low? This is an area of much interest and the research shows very promising results. Some of these approaches—multiple measures, guided pathways, noncognitive assessments, predictive data modeling, and intrusive advising—are highlighted in the following presentation. What method or methods will work best at Sauk? I believe the answer to that is a solid, “it depends.” Approaches that work well for, say, a large, urban college will not necessarily be the best approaches for Sauk as a small, rural campus. What works in California, Florida, or Texas may or may not work well in Illinois. What is clear to me is that we must use data to determine what innovative approaches have worked and have not worked. When we try new approaches, a plan must be put into place to carefully analyze results. When students arrive for advising, we must be sure that we are collecting enough relevant data about the student so the advisors and faculty (as appropriate) have enough information about the student to be able to help them be successful. I would like to implement a three-stage approach to be implemented during the 2018-19 school year. This phase is already underway as part of the College’s HLC Quality Initiative portion of the accreditation process. For this initiative, the College is discussing collecting noncognitive data via the College Student Inventory™ (CSI) and developing a program for more intrusive advising for those students who we believe can be most effectively helped by more intervention. However, for this program to be most successful, data needs be be aggregated from several different systems (e.g. student information system [SIS], learning management system [LMS], CSI, and others) and analyzed. Ideally, a system would aggregate this data in a way that could provide (or provide the ability to add on later) predictive analytics or apply machine learning to help us find patterns that we didn’t even know to look for. In addition, the system needs to be useful and meaningful for advisors and faculty so they have access to data and communication tools necessary to intervene on a student’s behalf in a timely manner. We are currently in process with demonstrations from vendors, and I hope to have a solution selected or designed (if we decide to go with an in-house solution) and beginning to be implemented by the end of the fall 2018 semester. What impact did these initiative have on student retention, pass rates for gateway courses, or acceleration? Studying these results will (1) give us a better sense of whether those initiatives are working and worth continuing and (2) will give us a better direction as we look to expand into new initiatives. As mentioned above, this phase will depend heavily on results from the previous phase. However, some possible example initiatives might include the following: develop a corequisite support class for a gateway math, develop high-quality online developmental education courses, and expanding multiple measures for placement to include other measures (such as high school GPA). I would like for the trials for this phase to be developed in the spring 2019 semester for implementation in Summer 2019 or Fall 2019. Update 2/11/2018: Replaced original concentric circles diagram with an updated, clearer version. If my innovation plan is to be successful, it will need to be supported by a strategy to influence Sauk stakeholders to take part in the process. For this post, I am focusing on just one facet of the plan–collecting data as part of the advising process. Currently, the developmental education process at Sauk is pretty cut and dried. Depending on their placement test scores, incoming students are placed in the appropriate course. Incorporating other methods of placement such as the college preparation course I am proposing, though, introduces complexity to the process and so it also increases the chance for error. In addition, judging the effectiveness of the process will depend on collecting and analyzing as much data as possible. Following Grenny, Patterson, Maxfield, McMillan, and Switzler’s model in Influencer calls for finding a “vital behavior” to change and then applying six sources of influence. To achieve the result of having enough data to analyze the effectiveness of the plan, it is imperative that academic advisors collect as much relevant data as possible. While specific relevant measures still need to be defined, some examples of relevant data would include the following: high school GPA and specific course grades, ACT/SAT scores, at-risk markers, and participation indicators in college preparatory course (if applicable). Therefore, for this influence plan, the vital behavior is to ensure that a complete data set is collected for at least 80% of incoming students. It is not reasonable to expect 100% collection as data may not be available for all students and some students may not be willing to provide all data points. The Six Sources of Influence arranged as concentric circles. To be successful, I will need to engage all of the six sources of influence from Grenny, et al. 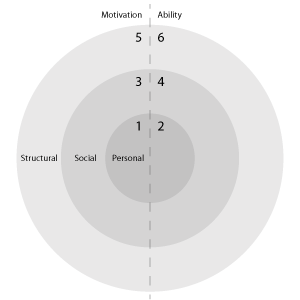 While the matrix in Influencer is useful, I prefer to think of the model as concentric circles as it shows the difficulty of penetrating all the way to the Personal level as well as the relationship between the Structural, Social, and Personal levels. Changes are easiest to make at the structural level, as they are what McChesney, Covey, and Huling call a “stroke-of-the-pen strategy” , a change that can just be made by saying it needs to be done. Structural changes will most directly affect the social level, which will in turn affect the individuals at the personal level. Structural, or external, motivation could be accomplished by providing printed or digital materials (posters, computer wallpapers, etc.) that remind advisors to ask for all the information, not just the minimum necessary to get the student’s immediate needs taken care of. …healthy peer pressure among advising staff. Between the healthy competition among advisors and the effect of seeing that other advisors are collecting the information, the social motivation will provide a powerful encouragement for advisors to remember to collect information. Healthy peer pressure will help advisors to be personally motivated, but much more can and should be done to affect the personal motivation realm. One key way to do this will be to clearly contextualize the data by repeatedly discussing the overall goal of the project and sharing data as it becomes available. This will help advisors to see the results of their work and how it is helping to help students succeed. To help advisors’ ability to collect the necessary information, the most important structural accommodation will be to make sure the database and collection forms are user-friendly and easily accessible. Good database design will also enable multiple advisors (and other personnel) to collect and enter information, decreasing the load on each individual advisor. Proper training, of course, is paramount to the success of any program like this. In addition to contextualizing the need for the data collection, training sessions can also equip advisors with clear descriptions of what data need to be collected and responses to common objections students may provide. A mnemonic device to help advisors remember the pieces of information that need to be collected could also be helpful. I believe that, with these measures in place, 80% data collection is an achievable result and will contribute greatly to the success of the overall project. Why do we Lose Creativity? Last night my son started dragging our old vacuum cleaner up the stairs, asking me to tear it apart so he could see how it works. That way, he could get started inventing his anti-gravity machine with enormous vacuums at the top and bottom. Of course, I was happy to oblige. It made me think, why do we tend to lose that creativity? How can I, as an educator and father, encourage, protect, and even reinvigorate that spark? As an information technology administrator and former web site developer for Sauk Valley Community College in Illinois, I have very limited direct contact with students and instruction. I do, however, have significant opportunities to impact learning environments and access for current and potential students. I have dedicated my career to using technology to improve efficiency and enhance collaboration. While technology does not hold the answers in and of itself, I sincerely believe that the improvements in productivity and collaboration technology affords will allow educational institutions to better face their challenges and find ways to thrive even in the most uncertain of times. Unequal access to educational resources is certainly not a new problem in education, it is not a lost cause, either. Unfortunately, the trend may be moving in the wrong direction. Opportunities most advantaged continue to increase combined with small increases for the lowest income brackets, while opportunities for those in between have decreased (Dahill-Brown, Witte, & Wolfe, 2016). Ethnic minorities continue to be underrepresented as well; for example in Illinois, black men in 1999 were about seven times more likely to be released for prison for drug offenses than to earn a bachelor’s degree (Alexander, p. 190). While many good efforts are in place to provide everyone access to quality education, a great many are still left behind. A contributing factor to unequal access to education is likely dramatic increases in tuition costs due to decreases in per student public funding. Since the 2008 recession, nine states’ per student funding is down more than 30%, and two states’ funding is down by more than 50%, which has required institutions to radically increase tuition while also reducing services (Mitchell, Leachman, & Masterson, 2016). Even where public per FTE funding has rebounded slightly from its 2011-12 low, it appears that rebound may be due to decreased enrollment as opposed to increased funding (College Board, 2016). In Illinois, which has been operating without a state budget since 2015, the funding situation is especially dire. Even community colleges, who pride themselves on access and low cost of attendance have had to make draconian cuts coupled with large tuition increases. Decreasing enrollment–due in part to rising tuition costs and uncertainty about the future of colleges–further exacerbates the problem (Rhodes & Thayer, 2016). Many states, including Illinois, have adopted performance-based funding as an answer to this problem, theorizing that tying funding to completion rates or other metrics will incentivize colleges to improve performance. Studies, however, have repeatedly shown that this approach does not actually improve those metrics (Hillman, 2016). Instead, institutions are essentially forced to “teach to the test,” regardless of whether those tactics are most effective for their context. Again in efforts to ensure that public funding is directed to the most deserving recipients and desired results are being achieved, standardized testing has risen dramatically in recent years, particularly since the passing of the No Child Left Behind Act, even though studies have shown the negative effects, including reductions in subjects taught, quality of education, and even increased segregation based on ethnicity and income (Knoester & Au, 2015). Though some decision making was later moved back to the states (Layton, 2015), standardized testing results still largely dictates the level of funding educational institutions receive. While standardized testing–and perhaps even government-mandated testing–serves a purpose, it also consumes increasingly valuable administrative and instructive resources and makes it more difficult to adapt the learning experience to local contexts and individual learners. Finding a balance between complying with federal and state regulations while also providing excellent, adaptive learning experiences will become increasingly important and difficult. As discouraging as the challenges can be, I would not be in the field of education if I did not believe the opportunities were as plentiful as the challenges. We live in an amazing time when technology is proliferating at a rate never seen before. The Internet has made information available to nearly everyone, mobile devices put that information at our fingertips, and social media allows us to broadcast information instantly. I believe technology, properly applied, can help educational institutions adapt and thrive in the face of these and other challenges. Never in history have we had access to as much information in as many different formats as we do today. Anyone can watch a how-to video, take an online course, or ask a digital assistant for a trivia answer. The role of teacher is shifting as a gatekeeper of information may go away, but the role of coach for how to seek, process, and analyze that information has never been more vital. This also “evens the playing field,” giving low-income and minority easier access to information that had previously may have been only available to the more privileged. Information technology also assists the prospective student with access to higher education. Institutions have for many years used their web sites to provide prospective students information about college. More recently, however, large data sets and application programming interfaces (API) allow institutions to provide up-to-date career information, success and completion rates, and more, with relatively little effort. For example, at Sauk Valley, I redesigned our program information pages (e.g. Economics) in 2016 to include related career profiles from careeronestop.org. Our new home page design (to be released in April 2017) will contain a tool allowing users to compare colleges on cost, debt, retention, and earnings with data from College Scorecard. Technology also plays a vital role of improving efficiency, so responsible application of technology resources will enable institutions to continue to offer excellent educational opportunities even in the face of decreasing funding. Innovation and competition often even make it possible to access new opportunities while reducing expenses. As an example, increased innovation in the phone sector have made new features such as videoconferencing and virtual extensions available at a fraction of the cost. At Sauk Valley, I am exploring systems that can connect our students with faculty and staff in ways never before possible while reducing expenses by 90%. Finally, collaboration is enabled by technology in many ways as well. Whether in a traditional or virtual classroom, collaboration tools allow students to apply creativity to learning environments and to hear diverse thoughts and experiences. At Sauk, we are exploring turning some lounge and information display areas into collaborative spaces, allowing students a places gather and work together on projects. In addition, we are exploring online meeting software in conjunction with our communication platform and learning management system to allow students to communicate with one another and with instructors for discussion. While these examples may not seem like the most exciting examples of educational innovation to many, I truly believe that my role on the administrative side of the institution helps enable the institution, instructor, and learner to be successful. Alexander, M. (2010). The new Jim Crow: Mass incarceration in the age of colorblindness.